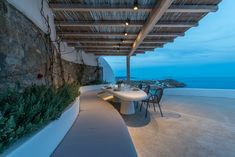 It’s perfect location in the outskirts of Mykonos Town, in Agia Sophia, has endowed this beautiful villa with an amazing view of the Agean Sea from all the indoor and outdoor areas. 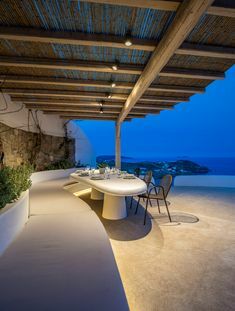 The sunset here is a whole experience in itself, calling for lazy cocktails on the veranda, before a cosmopolitan night out in Mykonos Town (the villa is only 5 minutes drive away and is perfect for those in the mood for frequent sorties). 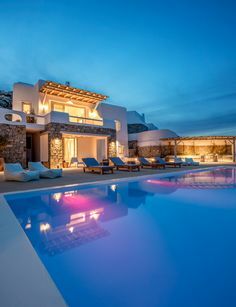 The orientation of the villa provides daylight until late in the evening, making the evening a special time for enjoying the views from the pool, the two different dining areas and the smart lounging spots. The outdoor dining area is ideal for breakfast or dinner with the sea…on your plate! 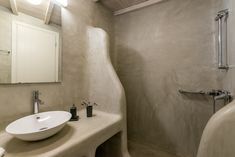 The villa has two bedrooms with queen size beds in the main house (the master bedroom has magnificent views), two guesthouses with a separate entrance from the pool level, and a third guesthouse in the garden. The guests staying in the guest rooms have some catering autonomy using the pool bar and the kitchenette. The interior décor creates a lively and cosy environment, with luxury and personal details, from the marble floors and the wooden ceilings to the art works on the walls. 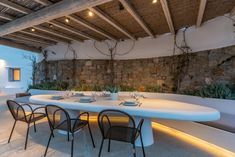 The whole experience is original Myconian: a private hangout with Cycladic style and perfect views while the best restaurants, shops and bars are within easy access. 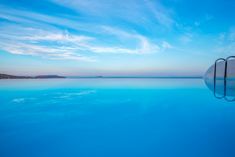 Range of in-house activities such as yoga, pilates, guided meditations, personal training, massage therapists etc. Stocking of fridge with fine wines, groceries etc.